MILLINOCKET — The Northern Forest Center has reached goal to raise $1 million in investments for its Millinocket Housing Initiative Fund. The Center created the Millinocket Housing Initiative Fund, its first social and economic impact investment fund, to create quality homes for people who want to make a future in Millinocket. Only two years after the launch of the fund, the Center has purchased six buildings and renovated five, turning dilapidated downtown properties into comfortable, high quality homes. Three of the completed renovations were extensive, reconfiguring the living spaces, replacing all windows and insulation and replacing a roof. 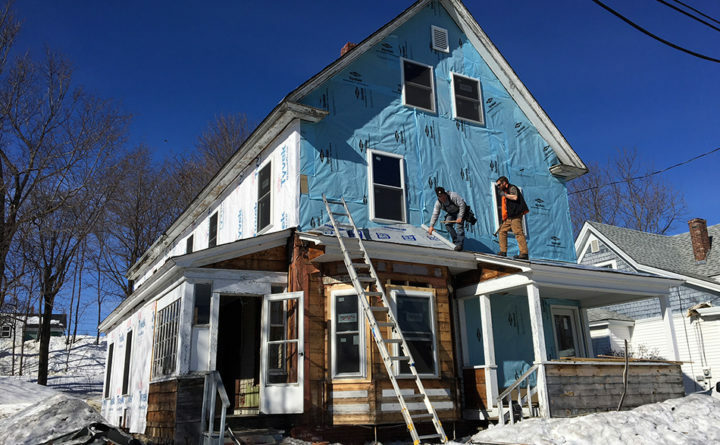 In February, the Center began a top-to-bottom renovation on the sixth property at 100 Katahdin Avenue, a grand but long-abandoned home on Veteran’s Park within an easy walk to downtown stores, the elementary school and the library. The renovation — the Center’s most ambitious Millinocket renovation project to date — will reconfigure the building from five apartments to three. McLaughlin Builders of Medway, Maine, is heading up reconstruction of the building and expects to complete work by August. Housing is one piece of the Center’s broader strategy to support a strong and diversified economic future. In Millinocket, the Center has combined philanthropy and impact capital for its Housing Initiative and will bring its tax credit expertise to the Memorial Library renovation and Our Katahdin’s mill site redevelopment effort. “It’s amazing what a unified capital approach can accomplish, and it provides so many more entry points for supporters to get involved,” said Adams. In addition to the financial resources, the Center is supporting development and improvement of recreational trails, managing building renovations and helping convert buildings to wood pellet heat, all programs supported by donations and grants. “You can’t beat the back yard here either, with endless adventure at my doorstep,” added Smith, who is program director and COO of the Outdoor Sport Institute. “Having this beautiful rental home available from the Center made my transition easy, and it’s made it easy for my friends and colleagues to experience the area as well. Everyone who’s stayed with me has left saying ‘this is awesome, maybe we should be looking at places here too,’” he said. “The Fund has enabled the Center to fill a critical need in Millinocket, but we’re nowhere near done,” said Riley, who announced that the Center is developing a Phase 2 fund for Millinocket that focuses on commercial real estate redevelopment. The Center is also raising a similar fund for community investment in Lancaster, N.H. The Center is paying interest to investors in the funds and will repay the capital at the end of the investment term. The Center welcomes inquiries from people who would like to support Millinocket’s revitalization efforts. Please contact Lila Trowbridge for more information, or make a donation via the Center’s website (https://northernforest.org/donate) or by mail to 18 N. Main Street, Concord, NH 03301.